Now that the Senate has approved an overhaul of the nation’s immigration laws, the issue moves to the House where Republicans, who control that chamber, held a private session Wednesday to discuss what the GOP should do. The outlook is less certain in the Republican chamber, in part because of the sizable contingent of Tea Party Republicans. One objection raised to providing a path to legal status for undocumented immigrants in the U.S. has been the idea that such action would reward them for illegal behavior. While 68% of all Republicans hold that view, this belief is particularly pronounced among Republicans who say they agree with the Tea Party. More than eight-in-ten (82%) regard legalization of an undocumented immigrant’s status as such a reward. Republicans aligned with the Tea Party are also less likely than Republicans overall to see a positive side of undocumented immigrants. 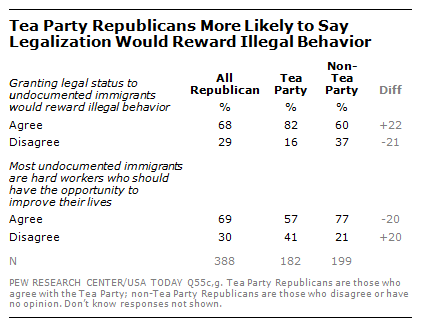 While 57% of Tea Partiers agree that most undocumented immigrants are hard workers who should have the opportunity to improve their lives, that’s lower than the 69% of all Republicans and the 77% of non-Tea Party Republicans who hold that view.